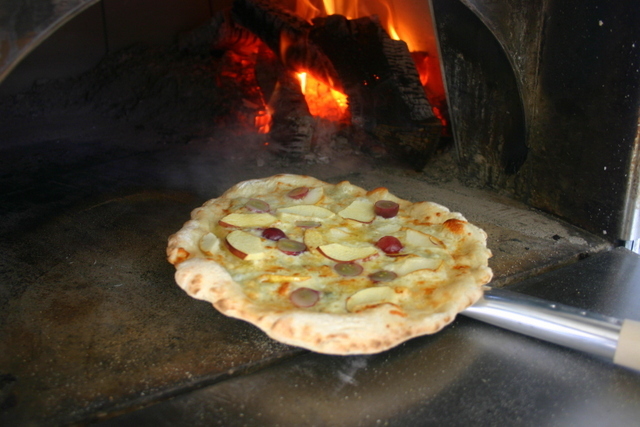 Extra virgin olive oil, fior di latte fresh mozzarella, Gorgonzola, fresh Bosc pears, Granny Smith apples, and red grapes. 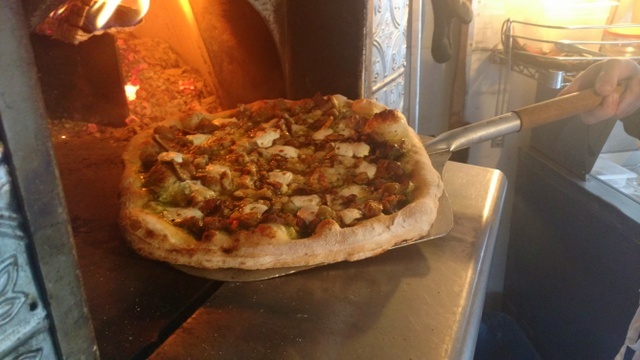 Options: Toasted pistachios, caramelized onions. 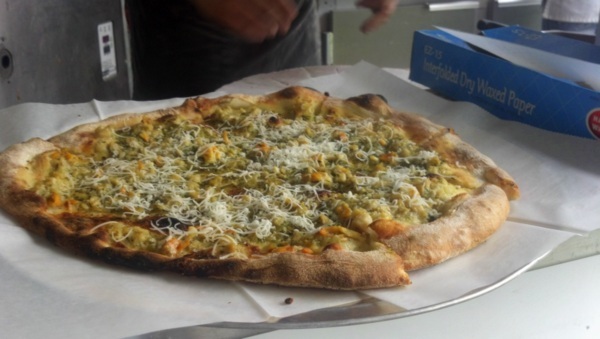 Fresh basil pesto, garlic, Parmigiano-Reggiano, Asiago and fior di latte fresh mozzarella cheeses. Marinated in our Spanish sherry wine vinaigrette then cast iron grilled in the wood fired oven, the vegetables we choose for your event will be determined by your tastes and what is most attractive from our local growers…to include, (but not limited to): Eggplant, summer squashes, onion, fennel, sweet peppers, hot peppers, tomato, chard, scallion, fresh garlic cloves and mushrooms. 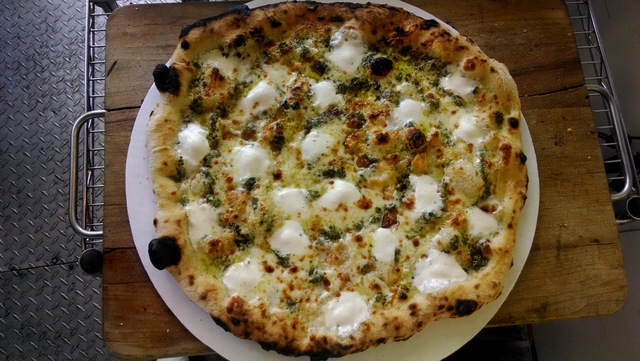 Pie assembly starts with our fresh basil pesto, (no nuts or cheese), Fior di latte (fresh cow’s milk mozzarella), grilled veggies and Asiago cheese. 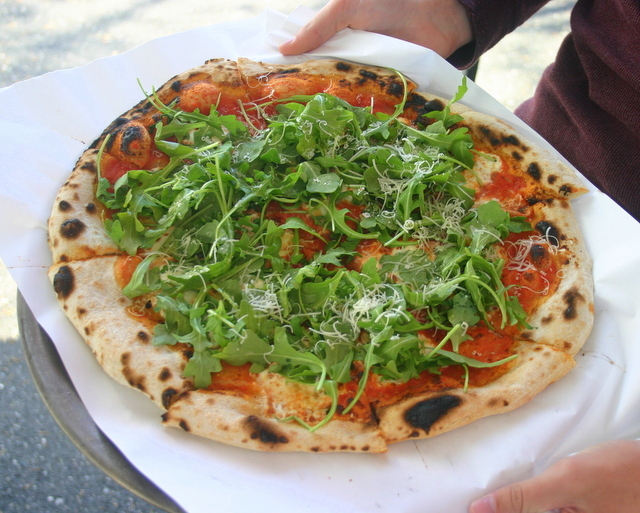 Alternate options: Sauce: Extra virgin olive oil OR San Marzano pomodoro sauce in place of pesto, and goat cheese. 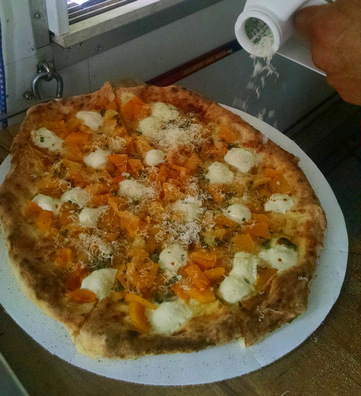 Fresh Fior di latte mozzarella, butternut squash, fresh sage and Gruyere cheese. Finished with Parmigiano-Reggiano. Meat Option: Add apple wood Bacon candied w/ maple syrup. 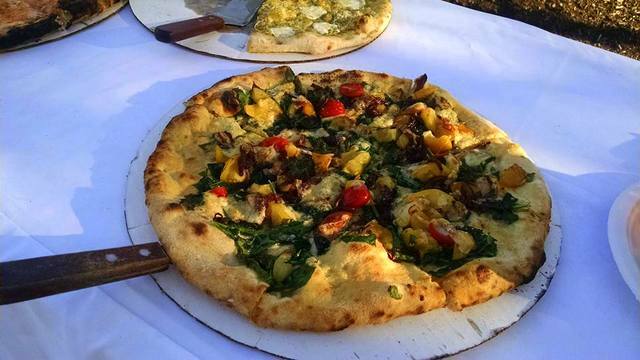 Roasted eggplant and Crimini mushrooms: with garlic, sun fired peppers, pesto, and fresh Fior di latte mozzarella. Clams sautéed with basil pesto, garlic, oregano, and extra-virgin olive oil. Finished with grated Parmigiano-Reggiano. 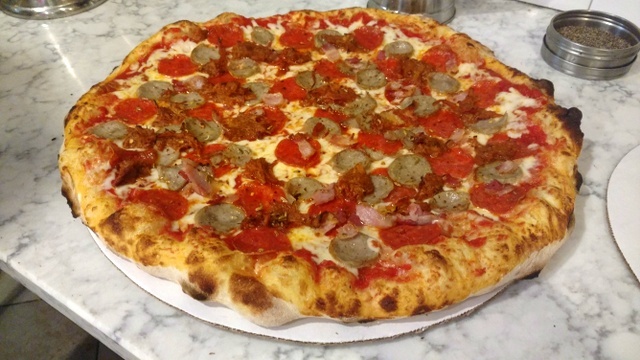 San Marzano pomodoro sauce, Fior di latte fresh mozzarella, sausage and caramelized onions. 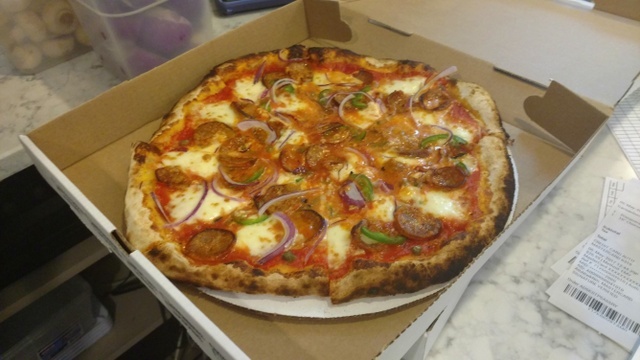 San Marzano pomodoro sauce, Fior di latte fresh mozzarella, gorgonzola, sausage, capers, jalapenos and red onion. San Marzano pomodoro sauce, fresh basil, fresh garlic and oregano. Finished with Parmigiano-Reggiano,extra virgin olive oil and seal salt. 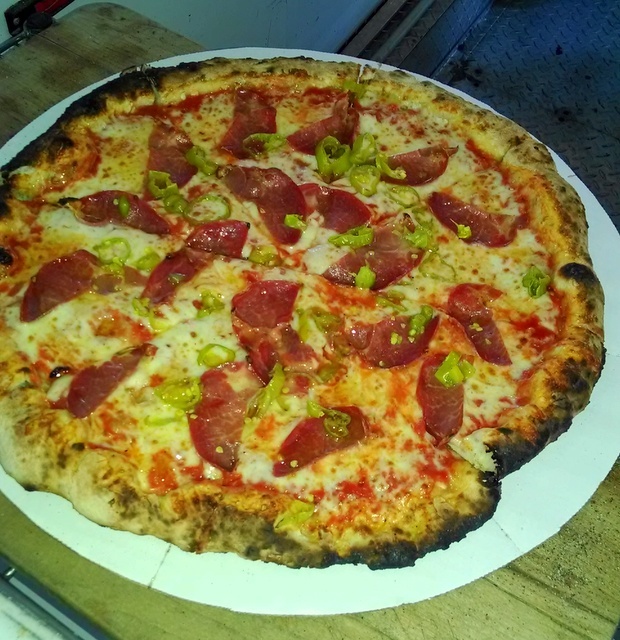 San Marzano pomodoro sauce with shredded mozzarella, Capocollo, and pepperoncino. Finished with a drizzle of honey. 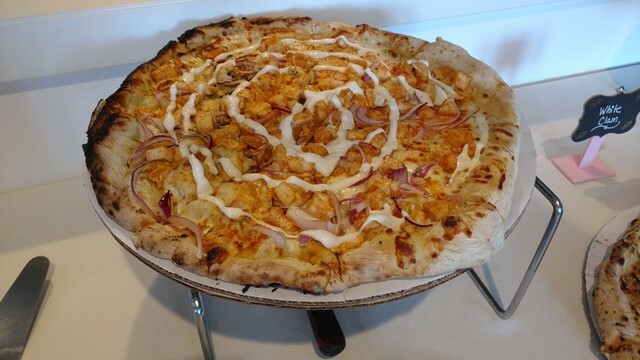 Spicy Buffalo sauce with shredded mozzarella, Buffalo roasted chicken breast, and red onion. Finished with a drizzle of ranch dressing.